We’d love your help. Let us know what’s wrong with this preview of Void by David Staniforth. Memories define us, they tell us who we’ve been in the past and give insight to who we are likely to be in the future. But what if you wake with no memory? Tom Gardener faces this very situation when he wakes in a freezing car with no idea where or who he is. As memories emerge, fuelled by music and dreams, so too comes a sense of dread that there may be things he does not Memories define us, they tell us who we’ve been in the past and give insight to who we are likely to be in the future. But what if you wake with no memory? Tom Gardener faces this very situation when he wakes in a freezing car with no idea where or who he is. As memories emerge, fuelled by music and dreams, so too comes a sense of dread that there may be things he does not want to recall. Is his mind protecting him from something? To ask other readers questions about Void, please sign up. I want to extend my gratitude to David Staniforth for a copy of Void and the invitation to beta read the novel for him. The following review reflects my objective opinion of the book. David Staniforth. People, remember this name. This one’s authorship stock is rising exponentially! Void is the newest creation from the pen of Mr. Staniforth. His previous books have included a fantasy trilogy, a two-book (so far) second fantasy series, and a psychological suspense read titled Imperfect Strangers. I I want to extend my gratitude to David Staniforth for a copy of Void and the invitation to beta read the novel for him. The following review reflects my objective opinion of the book. Void is the newest creation from the pen of Mr. Staniforth. His previous books have included a fantasy trilogy, a two-book (so far) second fantasy series, and a psychological suspense read titled Imperfect Strangers. In my opinion, each novel he writes is better than the last. Considering I awarded his last 3 novels a 4 star- and two 5 star ratings, Void is under real pressure to live up to these works, and to me it succeeds with flying colors. This is a great book to go into cold, so I will strictly avoid discussing the plotline. I would characterize the read as a psychological mystery. To be a bit more specific, it is a fascinating psychological journey of discovery. The major theme is just how much can we trust our memories? Is what seems a recollection a real memory or is it invention? How can you really know? Mr. Staniforth brings a unique feature to Void with his significant references to actual musical compositions (including songs by Fleetwood Mac, Aerosmith and Derek and the Dominos) and his demonstration of how deeply emotional connections to music can lead to the unlocking of long-buried memories. The story unravels slowly but steadily, with Mr. Staniforth dropping little clues here and there to tantalize us. It was great fun attempting to pick out the real clues from the innocent statements or observations. The story crescendos as we approach the end with some emotionally powerful revelations. The ending is done perfectly. Granted, there are a few intentional loose ends, not for the purpose of a sequel, this is NOT a cliffhanger, but to allow us to fill in the blanks on our own. I was highly satisfied with the ending. Oh, and the title is PERFECT. What didn’t I like? Not much. Early on, I was a little confused about the timeline of the narrative, but after just a little while, I caught on. The author has since rectified that issue. I also had some questions about the whereabouts of our protagonist during certain times of the year. Thirdly, I think there may have been a small liberty taken with a certain psychological diagnosis, but none of these issues were major to me and none changed my overall view of the story. I highly recommend this psychological journey to everyone who enjoys a strong character study. I found the writing brilliant, ingenious, and oh so refreshing. If you have not read anything by David Staniforth, you are truly missing out. Do yourself a favor and give this book a try. Five giant stars from me. WOW! OH WOW! I am left speechless. All I can say is to read this book you need to listen to the songs and read the lyrics while reading this book as the author asks, it will give you the true atmosphere in reading this book. It has given me goosebumps, and chills going right through me. I just want to thank David Staniforth for giving me this experience in reading this book. I am so touched how the music has moved me. I listened to every song right after it was mentioned. All I can say is Wow! Fantastic! I am so moved and you will be too. If you haven't read this book, you NEED to. This book is a must and I never tell anyone that they need to read a book but I want to share this with you. Its not a long book, its only 180 pages. I thought it would onlytake me a day to finish it but boy was I wrong, I had to listen to every song and read the lyrics over and over again. I was so moved and touched. It was such an awesome feeling and never felt this way in reading a book. I repeat its a must read. There was not one character that I disliked. I repeat there is not one book that I have read that has touched me this much. If you read this book, please do come back to me and let me know how you felt, I would love to hear your thoughts. I know you will be moved and touched also, unless you are dead. I recommend this to everyone. All I got to say is this will give you the WOW factor that we look for in a book. It sure did it for me. I am not going to put any spoilers in this review. I don't want to spoil it for you. This is about a man who doesn't know who he is and searches through his inner self to find out the person he really is and goes through a rough time in figuring it out. Thank you so much to David Staniforth for providing me a copy of this book. VOID by DAVID STANIFORTH is an interesting, moving, unique, and a suspenseful mystery/thriller that I thought was an absolutely fascinating look into a psychological journey of discovery from our main character’s perspective through the help of journal entries and song. The author does suggest that you listen to the lyrics of the songs that are mentioned within the book to enhance the journey you take with the 4.5 stars! The author does suggest that you listen to the lyrics of the songs that are mentioned within the book to enhance the journey you take with the main character but I didn’t end up listening to the songs and I was still able to enjoy and connect to the narrative and the atmosphere through the author’s descriptive and expressive writing style. What really grabbed my attention when I first noticed this book on my feed was that great cover and the title which I thought were absolutely perfect and very fitting to this story! DAVID STANIFORTH delivers a well-written and slow-burning read here where the story builds up slowly but in a way that grabs your attention right from the very beginning. To sum it all up it was an extremely entertaining, refreshing, interesting, and steady-paced read with an ending that left me feeling totally satisfied. Highly recommend!! Going into this novel, I knew it dealt with amnesia, but had little knowledge of the entire premise of the book. I’m glad I went in somewhat blind. When Tom wakes up in his car, he is freezing cold, unsure of where he is. Worse yet...he is unsure of WHO he is. He discovers a journal he hopes will help him piece together his missing memory and reclaim his life. This book reads quickly as you travel alongside Tom, driven to put back the pieces of his life and perhaps fill in the missing gaps along Going into this novel, I knew it dealt with amnesia, but had little knowledge of the entire premise of the book. I’m glad I went in somewhat blind. This book reads quickly as you travel alongside Tom, driven to put back the pieces of his life and perhaps fill in the missing gaps along the way. Again. Because strangely enough, this isn’t the first time Tom has disappeared! Well crafted, I was instantly pulled in and my attention held throughout. I thought I knew where this book was heading, but it quickly turned in a direction I never expected and totally enjoyed the deception. Thank you to David Staniforth for providing me a copy of this novel in exchange for an honest review. Do not think for one minute this is just another amnesia tale. No sirree bob. I applaud the author for taking amnesia off the beaten path and doing something with it that I have never encountered. It worked. A fleeting figment of a memory, a recurring nightmare, are they based on reality? Are they manufactured? What is the mind trying to share with its owner? The opening is gripping, the pacing just right. Oh, and I loved the story behind the ugly monkey doll in old Mrs. Gaskell's home. Can you imagine the bone chilling dread on waking up, to discover, not only that you have no idea where you are, but also that you have no idea WHO you are? This is how we meet our protagonist, a young man who wakes up in his car one freezing cold morning, in a place he doesn't recognise. He finds a journal in the car that attempts to answer some of his questions, but he's not entirely sure he wants to find out, he has the feeling that he might have done something really bad in his past. The mind is a tricky little devil at the best of times - can we know for sure, that something we thought we experienced in the far distant past, be really true? did it happen exactly as we remember it? Is it our memory playing tricks? Void was the perfect title for this engaging mystery, it was impossible not to get caught up in who our protagonist was, where he had come from, and more importantly what secrets were lurking behind his memory loss. 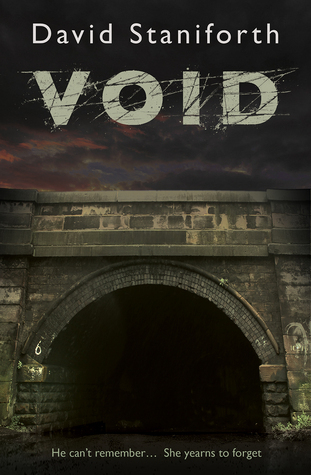 VOID by David M. Staniforth is a psychological thriller/journey of one man’s struggle to deal with his missing memories. The title and cover of the book are perfect for creating the atmosphere for this novel. Music adds another important element to the story. I went into this novel with no concept of what to expect…but have come out a different person. Can our memories be really trusted? “The sense of being in the wrong place, with absolutely no idea where the right place might be, is an unnervin VOID by David M. Staniforth is a psychological thriller/journey of one man’s struggle to deal with his missing memories. The title and cover of the book are perfect for creating the atmosphere for this novel. Music adds another important element to the story. I went into this novel with no concept of what to expect…but have come out a different person. Can our memories be really trusted? Tom awakens in a freezing car, in a suit, on a hill in a place called Wincobank in the city of Sheffield, He doesn’t know who he is. He can’t remember anything. No memories at all. Where did he come from? Why can he not remember? All he discovered is a lilac journal, black notebook and a pink envelope in the glove compartment, apparently written by him. The pictures are of Penny, Kaitlyn and himself. So begins the journey, and Tom starts to read the journal, in hopes that it may trigger a memory. Penny, his supposedly live-in girlfriend suggested he keep a journal to invoke memories. Tom met Penny and her girlfriend, Kaitlyn, both studying nursing at the University, at a pub called “The Foundry” where he was playing guitar and singing. Penny indicates that Tom goes away every January for seven to nine days…but where? And when he comes back he doesn’t remember where he has been! He is also not able to remember anything before the age of twenty. So strange? This is a well-developed book, from the clever title and front cover, to the ending. Characters come alive as you read each small detail unfolding. The imagery is vivid and enables you to sense the atmosphere of the various places. The dialogue is so natural and well written, you can imagine the voices. I loved this thought-provoking book and give it a well-deserved 5-Star rating. Many thanks for an advanced copy of the book. Much appreciated and enjoyed! Right now, stop what you're doing, and go get VOID by David Staniforth! It is an extraordinary book!! And as the author suggests, listen to the songs he mentions in the book. Listening to the music adds another dimension to the story. For 51 weeks in each of the last nine years, Tom has lived an ordinary life. For one week, he disappears and can't remember who he is, where he is, or what he's done. This year will be different, but can he trust his memories? Are they real? Are they from a dream or Right now, stop what you're doing, and go get VOID by David Staniforth! It is an extraordinary book!! And as the author suggests, listen to the songs he mentions in the book. Listening to the music adds another dimension to the story. For 51 weeks in each of the last nine years, Tom has lived an ordinary life. For one week, he disappears and can't remember who he is, where he is, or what he's done. This year will be different, but can he trust his memories? Are they real? Are they from a dream or his imagination? I love it when a book elicits an emotional response from me, and this book did that! From wonder, to dread, to sympathy, to shock and surprise. The author showed wonderful insight into his characters and their relationships. I loved feeling like I was part of the crowd in The Foundry. I was entranced from the first chapter. I hated to put it down, so I carried my iPad around the house with me. Brewing coffee? I'll read while I wait. Eating lunch? I'll read as I chew. I had to know what was going on and what had happened. The cover artwork is excellent. There is a similar tunnel near my home, but it's not that threatening. This will be one of my favorite books for 2016! You won't just read this story-you will experience it! David Staniforth has hit the ball out of the park once again with a book that will stir all your 'senses'. With such descriptive writing, my mouth still waters for the hot, salty chips that the protagonist craves. I can see the hills, the gun stand, the dark tunnel. I hear the tick, tick of the bike wheels on asphalt. And last-I can hear and feel the music that plays such an integral part of this story. But all of this is just a bonus, as the You won't just read this story-you will experience it! But all of this is just a bonus, as the real story here is about a man with a past that he can't remember. What secrets is his brain protecting him from? What happens when he finds out-will It destroy him or make him whole? That's as much of the storyline that I am going to get into. It's best if the reader goes into this relatively cold to get the full enjoyment of Staniforth' s writing style. His research and knowledge about this subject shines though, (I love a book that makes me smarter by the end of it) and as with his first novel Imperfect Strangers, the characters are well developed and memorable. Top all this off with an ending that provides closure and emotional satisfaction and you have the markings for a well earned 5 star review. This is a book I obviously recommend highly, and I can't wait to see what come next from this author! Void by David M Staniforth is a mystery thriller that was very well written it also had a lot of psychological aspects to it which made the whole read a bit more twisty it was a quick easy read that kept me turning the pages. A man wakes up freezing in a car not knowing his name why he was there & what he had done he had a journal to which he could find out about his past BUT DID HE WANT TO FIND OUT THAT IS THE QUESTION?? he finds out that he was going to get engaged to Penny but has not comm Void by David M Staniforth is a mystery thriller that was very well written it also had a lot of psychological aspects to it which made the whole read a bit more twisty it was a quick easy read that kept me turning the pages. A man wakes up freezing in a car not knowing his name why he was there & what he had done he had a journal to which he could find out about his past BUT DID HE WANT TO FIND OUT THAT IS THE QUESTION?? he finds out that he was going to get engaged to Penny but has not committed to her yet WHY IS HE HOLDING BACK we find out about penny in the journal, she has a few secrets of her own. I felt emotionally exhausted by the time I finished Void - in less than 24 hours because I simply could not put it down. Void is one of those books that slowly ratchets up the tension until you find yourself completely immersed and oblivious to the outside world. Imagine waking up in the freezing What a great read! Imagine waking up in the freezing cold, in a car, parked on an unfamiliar street, with absolutely no idea of where you are, how you got there, and even worse, who you are. I have read one of David Staniforth's previous novels, Imperfect Strangers, which was a gripping 4* read for me. He has surpassed himself with Void. Oh how I wish I liked this one more! It really did start off holding my attention, and I was excited as to where it could lead. However, the writing was flat, and often I found myself wanting the story to get on with itself. There are lots of theories as to why the main character suffers from amnesia and why he disappears once a week every year only to return home with no memories. Not only does he have no memories of this, but also the first 19-20 years of his life. I felt the strongest part of Oh how I wish I liked this one more! It really did start off holding my attention, and I was excited as to where it could lead. However, the writing was flat, and often I found myself wanting the story to get on with itself. There are lots of theories as to why the main character suffers from amnesia and why he disappears once a week every year only to return home with no memories. Not only does he have no memories of this, but also the first 19-20 years of his life. I felt the strongest part of this book was his determination to uncover what happens during these these missing weeks, as a lot of questions are slowly revealed. Unlike other thrillers though, where a couple holds completely different realities, both here were so similar I felt I was reading the same story twice. Yes, the boyfriend suffers from amnesia and there are definitely some tense moments throughout. It felt as if the author had a great idea and wanted to keep reinforcing in it. Mainly that being, if we can't collaborate early memories, are they real? (I kinda hope so as an only child) To quote from the book, " Do we not over time believe those altered accounts and fix them to some form of false permanency in our minds? And once a false memory is fixed, how would we know it to be false without someone to corroborate or deny it?" See? Great premise, just didn't follow through for me. There were two major high points for me in this book. Firstly the opening scene - what a great idea having a man waking up, freezing cold in his car with no memory of who or where he is. And then of course the event of finding the girl and the mother (not saying any more because I do not want to spoil the book for anyone). This was for me an enjoyable and very informative book and some of the discussion about how we retain memories and how accurate they are was extremely interesting. VOID (clever There were two major high points for me in this book. Firstly the opening scene - what a great idea having a man waking up, freezing cold in his car with no memory of who or where he is. And then of course the event of finding the girl and the mother (not saying any more because I do not want to spoil the book for anyone). "He can't remember.......She yearns to forget." Not just another psychological thriller here, but a uniquely told story of memory loss that kept me guessing about our protagonist's real life right from the very enticing start straight through to the revealing emotional conclusion. Pretty freaky not knowing who you are, to go missing for one week each January plus not remember the first twenty years of your life, but combined with fear of the unknown and hints of wrong-doing, made for an entertaining and mysterious game of clue. Told from two perspectives, there is a bit of clutter, but the story behind the ominous tunnel, the well-defined minor characters, and the bit of creepy we get from the 'lucky dip game' made VOID a memorable 4 Star read for me, and ya know.........some questions truly are best kept unanswered. Really enjoyed my first, but not last, David M. Staniforth novel. The man woke in the front seat of the car; behind the steering wheel – as cold as ice with frost on the windscreen and a deep chill inside the car. Obviously he had been there awhile – but where was he? For that matter, who was he? Starting the car and cranking the heat to high was his first priority – searching the vehicle for evidence was his next. And when he discovered the lilac coloured journal in the glove compartment with an unfamiliar scrawled note on it saying “Read me – ple Phenomenal!! The man woke in the front seat of the car; behind the steering wheel – as cold as ice with frost on the windscreen and a deep chill inside the car. Obviously he had been there awhile – but where was he? For that matter, who was he? Starting the car and cranking the heat to high was his first priority – searching the vehicle for evidence was his next. And when he discovered the lilac coloured journal in the glove compartment with an unfamiliar scrawled note on it saying “Read me – please” he began a journey of discovery – but was it one he wanted to make? Void by David Staniforth is an unbelievable psychological thriller that had me breathless with the suspense of it – unable to put it down, yet not sure I wanted to read on. At one stage I was laughing out loud, then not much further on I had tears in my eyes and a lump in my throat. My review is short as I don’t want to give anything away, but I highly recommend all thriller fans read this book! It is fabulous! Thanks to the Goodreads friend who recommended it to me…what a read! A void in one’s memory is filled with more than the fear of not knowing; it swirls with the dread of what those missing memories might contain. When a young man wakens in a freezing car, his mind a complete blank, he embarks upon a journey that brings that very dread to the fore. A bloke wakes up in a car on a A void in one’s memory is filled with more than the fear of not knowing; it swirls with the dread of what those missing memories might contain. A bloke wakes up in a car on a cold street. What is he doing there Who is he? And so our story starts. For 51 weeks in each of the last nine years, Tom has lived an ordinary life. For one week, he disappears and can't remember who he is, where he is, or what he's done, but this time things are going to be different, this time he has a lilac coloured journal from himself to read? Worse, what happened to his first nineteen years of his life? A unique, clever, very different thriller that makes you think, yes really think, how do YOU trust your own memories, not only gripping, tense and well written it is also thought provoking. Kept at a great pace, strong, powerful characters with a story that comes together with a few suprises and shocks. Not only have I read a book in four days, but I have learnt, yes a story that really makes you think !! David my thanks also for making this book available to members of my group " A Good Thriller" but also agreeing to do a Read a long and Q & A's. A great second thriller from you, and NO I still do not like fantasy...! VOID.The cover and the enticing blurb will beckon you to enter David M. Staniforth’s outstanding psychological mystery, Void. A man wakes up in a car, freezing, not knowing where he is. Not knowing who he is. We soon learn, thanks to a journal that he finds in the car, that his name, apparently, is Tom. According to what is written in the journal, he has no memory of his childhood or teenage years. Incredible, yes. Even more mystifying is that evidently, he disappears for more than a week at the VOID.The cover and the enticing blurb will beckon you to enter David M. Staniforth’s outstanding psychological mystery, Void. A man wakes up in a car, freezing, not knowing where he is. Not knowing who he is. We soon learn, thanks to a journal that he finds in the car, that his name, apparently, is Tom. According to what is written in the journal, he has no memory of his childhood or teenage years. Incredible, yes. Even more mystifying is that evidently, he disappears for more than a week at the same time every January and has no recollection of who he is, where he goes, or what he does. At first glance, Void seems far-fetched and unbelievable. After all, this author has written a number of fabulous fantasy novels. This novel, however, is much, much different. Get ready to Google, or use whatever search engine you prefer. There is factual basis for Tom’s memory disorder, and I recommend that you take time to look it up. I even checked NAMI, Mayo and Cleveland Clinic’s web sites. Now, does the author take some artistic liberties? Yes; nevertheless, Mr Staniforth took me on a journey that I will not soon forget. “Tom” – he does not even know if that is his real name – finds a note with the journal. A woman called Penny, seemingly his live-in girlfriend, urged him to write things down in hopes that it would eventually spark some memories. Tom’s story is revealed to the reader as he learns it. In disclosures from the journal juxtaposed with events that occur while he is AWOL from his present-day life, we get a sense of who this man is. We see his integrity, his goodness, and his resolution as he pushes onward through the fear of the unknown in an attempt to discover his past. We also learn about him through the Penny’s eyes, through the words of an old woman who befriended him, and through interactions with folks he meets in Sheffield, the city where he turns up on that cold January day. Tom has nightmares that cause him to question whether he is really a good person. What if he has done something terrible? Penny’s friend Kaitlyn questions too, acting as a voice of reason that had me doubting at times as well. I made my determination, and I think it’s up to each reader to decide about Tom’s character and about his past. What we do learn is that memories can be elusive. Sometimes they are suppressed. Sometimes they are altered. Sometimes people who share the very same event remember details quite differently. And what about dreams? Can they ever accurately reflect our memories? My overall impression of Void is that it is a beautifully written story. It is filled with expressive language and images. I would urge readers to pay careful attention to the images that are repeated, as there are many clues about what is important to the discovery of what happened in Tom’s life. The book has references to real places (like the Devil’s Arse), which I found quite fascinating. It has humor. Most importantly, it stimulates the mind. It made me think, not just about the contrasts between the characters and their memory deficits, but also about memory in real life. Teachers and therapists (and authors, I suspect) know that writing often holds the key to learning, to memory, and to self-knowledge. Will the journal be the key that unlocks Tom’s deeply buried past? I know that the year 2016 is young, but I am certain that David Staniforth’s Void will be very near the top of my year’s favorite books. It is truly a wonderful creation. As one of Staniforth’s beta readers, I read this book twice so that I might be able to give my carefully considered honest, unbiased opinion. I thank David for the opportunity to read his brilliant work of fiction. Gosh this one was cool. I have always been fascinated with psychology, psychological disorders, human behavior, etc., so this book was right up my alley. The human brain is just fascinating and scary, all at the same time. Come to think of it, that's exactly how I would describe this book, fascinating and scary. Tom Gardener wakes up in a freezing car on a hill, with no idea who he is or how he got there. He finds a hand-written journal in the glove box, and opens it to discover it was apparently Gosh this one was cool. Come to think of it, that's exactly how I would describe this book, fascinating and scary. Tom Gardener wakes up in a freezing car on a hill, with no idea who he is or how he got there. He finds a hand-written journal in the glove box, and opens it to discover it was apparently written by him... and FOR him... to help him remember who he is. Only.... he doesn't remember writing it. Can he trust what is written in the journal? Can he trust the hints of memories he now thinks he might be having? Are they real memories or just suggested ones? And what if Tom remembers who he is and doesn't like what he finds out? Does he really want to know??? “Now that I am older and wiser, I know that winning covers a broad spectrum of definition.... you're always going to get something, but there's no guarantee you are going to like what you get. Void is the second book under the 'thriller' umbrella I've read by Staniforth and what a book! I'm finding it difficult to write this review because I don't know really where to start. Void is actually a brilliant title for the book. A 'void' has occurred in the mind of the main protagonist who wakes up in a car and can't remember why? Slowly tidbits are fed to the reader as we're thrown into the same void of blankness. How did he come about to be in the car and why? Clues are fed throughout and Void is the second book under the 'thriller' umbrella I've read by Staniforth and what a book! I'm finding it difficult to write this review because I don't know really where to start. Void is actually a brilliant title for the book. A 'void' has occurred in the mind of the main protagonist who wakes up in a car and can't remember why? Slowly tidbits are fed to the reader as we're thrown into the same void of blankness. How did he come about to be in the car and why? Clues are fed throughout and it becomes a journey of discovery with terrific characters and some brilliant descriptive prose as we get a feel for placement throughout. It's a clever take on amnesia which is sensitively done without being too obvious and falling for 'many times done' cliches. Refreshing and fitting I thought. I loved some of the characters as we got to know them and there are some touching moments in the book. There's one particular scene that is wonderfully comedic. I mean, seriously, it had me in stitches I was laughing so hard. A brilliant observational piece that was timed pitch perfect. It's pretty clear that the level of Staniforth's writing is steadily plotting itself upwards on the graph. After reading one of Staniforth's fantasy offerings I was delighted to see some of that brilliant descriptiveness and great storytelling here and hope that this books gets the recognition it rightly deserves. And, as an aside, that's a great bookcover! I'm ready for the next offering whenever Staniforth is ready. Better get writing then..... hadn't he?! This was such an interesting premise for a novel and worked so well. A man wakes up, freezing cold parked in a car, not knowing who or where he is. In the glove box he finds a journal supposedly written by him with a note from a woman he doesn't remember who claims to be his girlfriend Penny. He finds out his name is Tom and he lives in London, but has no memories of the first 20y of his life and for the last few years has disappeared for a week every January, eventually returning to London with This was such an interesting premise for a novel and worked so well. A man wakes up, freezing cold parked in a car, not knowing who or where he is. In the glove box he finds a journal supposedly written by him with a note from a woman he doesn't remember who claims to be his girlfriend Penny. He finds out his name is Tom and he lives in London, but has no memories of the first 20y of his life and for the last few years has disappeared for a week every January, eventually returning to London with no memory of where he's been or what he's done. This time Penny wants him to read the journal and keep a record of what he's doing to solve his missing lapses of time once and for all. Imagine,if you will,waking up in a car,dressed in a black crumpled suit,on a frosty night, the reasons for being there, unknown. Then a creeping dread begins to enter your consciousness as you slowly realise that the pertinent question that screams to be answered is not where are you,why you chose this particular destination,but alarmingly,who are you. In such a confused and disorientated state do you then discover a journal,enclosed within are photos of a man bearing an uncanny resemblance to you,a snapshot of a pretty woman and suddenly the dawning realisation hits you-you have no knowledge of these people, have no idea who wrote or even why this journal was written,or indeed why it is now in your possession. Slowly,hesitatingly and disbelievingly setting forth on this journey of self discovery,you begin to read the journal and discover that you are the scribe. In it,you describe the details of the most recent years of your life to enable you,the person who will invariably forget,to remember. But what of the first two decades of your life? Nothing,empty,the box wherein such memories are stored is devoid of all content. Your past is a mystery,your only clue to your true origins this journal and the black notebook that sees you determined to write down the events of the surreal reality you now find yourself in. Are the fleeting snapshots of a former life, that you find yourself experiencing,a true memory of past events or an attempt by your brain to put order on the chaos within the vacuum that exists in its place? How reliable are those memories? What has happened to erase the past and what,if anything,has drawn you to this place,at this time? What indeed,could have happened to merit the brain pushing the self defence mechanism,pulling down the steel shutters and preserving,if you will,a safe place for you to reside,a place where past memories, hurts,real or imagined (who can tell? ), unreliable nightmares and our worst fears of past behaviours can somehow be held at bay,put aside in the hope that new,happier memories may be sown in their place. In another part of the country,a lady wakes up to a week of self doubt,worry and strange acceptance of her lot. Yes,as she wonders at his mysterious yet expected disappearance from their life,the slow tendrils of mistrust and fear,planted by her friend Kaitlyn,slowly beginning to sprout. as if being pulled by invisible threads? Dear reader,such are the teasers that will confront you as you delve into this deep, beautifully crafted,psychological mystery. This was a fantastic,truly compelling story centred around our memories and the malleability of such. I loved so many different elements of this storyline,the fast paced plot,the different perspectives offered by the main characters, the innate mystery that saw ponderous questions being asked,clever,plausible links being made,all set against the backdrop of the wondrous capability of the brain to cope with matters our rational self cannot,at the time,contemplate or deal with. Written in sharp,crisp,prosaic language, peppered with carefully chosen descriptive phrases,this book was a delightful read,on many levels. I recommend this book to all lovers of thought provoking plot lines,fans of psychological thrillers and anyone who would like something a little different,a break from the norm,a book sprinkled with mystery,pain,love and that essential element we all seek,the page turning anticipation of what will happen next! I was given a copy of this book in return for a fair and honest review. When the author invited me to read this book assuring me it would be 'right up my street'. I was a little unsure because I have had lots saying this lately even in genres I don't read, but something made me take the plunge. I have to say I nose dived into the book not really knowing if I would like it. I can gasp in horror now because if not for the author I may have just kept this book on my Kindle as I had purchased this some many months ago, hesitating to read it. Just imagine yourself in a car, its freezing cold, you are in a street you don't recognize. Where are you? That would be enough right? Well no, its a case of who am I as well. Our memories can play tricks on us, they can distort events, selective memories..
And as memories return, can they be trusted. This is a very cleverly written book, I nose dived into it and it smothered me for hours where I forgot the world around me. Now that is mostly impossible for me to switch off from life,but this book did it. My reviews are usually very gut oriented meaning I talk mainly about the impressions a book leaves on me and what I feel reading it. I can't help it. A book, a song, a movie, a painting, any form of art has to make me feel something - good or bad. The amazing ratings this book was receiving plus the theme - amnesia - caught my attention. Like many others, I read this book quickly, I was eager to find out along with narrator who he was and what had happened. This is a well written, well paced novel. The reveal is well done and well paced, and David M. Staniforth was very careful covering all bases, not explaining everything but still making every plot point a satisfying end point. The angst Tom (the amnesiac) and Penny (his girlfriend) feel is real and touching. Many times you wonder along with them if it's really worthy trying to recover the memories lost. After all, some things are better left forgotten. Still, they persevere, despite their fears. This was a self published book, and I urge you to check it out. I'll definitely be reading David's other books. "Void" by David M. Staniforth is a well-written, intriguing read! A man so unsure of who he is, or was, awakens in a freezing car not knowing where he is. Upon discovering a journal in the vehicle, he learns this has happened before. It seems he has a happy life, a life he has completely forgotten. As memories emerge there is a sense of dread that possibly there are things he doesn't want to remember. Not only is the story filled with thought-provoking twists and turns but the author has incorpora "Void" by David M. Staniforth is a well-written, intriguing read! Not only is the story filled with thought-provoking twists and turns but the author has incorporated music throughout which adds to the experience. "Angel" by Aerosmith just happens to be one of my favourites. This story hooks you from the very beginning and doesn't let go until you know how it ends. As with his first novel "Imperfect Strangers" I thoroughly enjoyed it and highly recommend both. Void is a unique work of art that captures the journey of a young man who wakes up in a freezing car with no idea of who he is, where he is or what has happened to him. First of all I'd like to thank Sue for connecting me with David Staniforth and the biggest thank you to David for sending me the book and giving me a chance to read it. Second, I'd like to say that if you're looking at this book contemplating whether or not to purchase it...Do it, do it now. Do yourself a favour and do it. I full Void is a unique work of art that captures the journey of a young man who wakes up in a freezing car with no idea of who he is, where he is or what has happened to him. I fully plan on purchasing this book in paperback form because I simply feel I have to. When I read and noted I was at about the 75% mark, I couldn't stop thinking about it and a few hours later in the middle of the night I was awake finishing it. I didn't want to finish it, I wanted to know how it ended but I just didn't want to part with it and that's how I know I have to have it. I was awake devouring an alarming amount of chocolate and clutching a pillow to my chest and all I could think about was how I wish I had the physical book to touch and to hold and to read over and over again. That sounded dramatic but I can't help it hah. So, Tom wakes up in a car in an unknown location. His memory is blank. He finds a journal with a note that says "Read Me Please" and upon reading it discovers it's his journal he wrote to himself. So he sets out on a journey to understand what is happening to him. This book has the magical ability to make you think something then make you question it 10 pages later. There's no other way to explain it. It just confuses you. It makes you wonder about every little detail you read. If it's real, if it's deceptive. That makes it easier to put yourself in Tom's shoes. Imagine your brain failing you and you don't know anything, not your age, not your name. Imagine the confusion and the fear, all the questions. Along the journey, Tom has a journal, his dreams and music assisting him but he can't really be sure of anything and it's a really interesting, intriguing journey at that. The music plays an interesting role in the story and listening to the songs mentioned at the time they are mentioned is a cool way to get the atmosphere. Music also seems to help Tom remember, or so he thinks because he's not really sure. There's a lot of uncertainty for good reason. He's uncertain if he can trust these little moments that feel like memories. It seemed like just effortlessly, Tom's uncertainty of his memories caused me to be uncertain of my memories. Maybe that comes from putting myself in the character's shoes but that wouldn't have been possible without the writing being so flawless and convincing. Void gripped me from the first page. A guy wakes up in a car and has no idea how he got there or even who he is. Stories of amnesia are plenty and quite often have that Lifetime Movie feeling. Fortunately, that wasn't the case here at all. Void was clever, and the title is actually perfect. How do you know what is a real memory? How easy is it to implant false memories? Void was a totally enthralling journey of discovering two people's pasts. I really enjoyed how the author linked music and memor Void gripped me from the first page. A guy wakes up in a car and has no idea how he got there or even who he is. Stories of amnesia are plenty and quite often have that Lifetime Movie feeling. Fortunately, that wasn't the case here at all. Void was clever, and the title is actually perfect. Void was a totally enthralling journey of discovering two people's pasts. I really enjoyed how the author linked music and memories. I even had to consult Spotify for a couple of the songs that were mentioned. So yes, I think it's safe to say I became fully invested in the plot and was desperate to find out who exactly the protagonist was and what had happened to him. Filling his void was a steady process that included lots of interesting, well-drawn characters along the way. The author has a very nice style of writing. This was my first book by David Staniforth, but I've already got his other psychological thriller on my Kindle. Great read! I was hesitating how to start my review, i wanted to find the right words to express how i really felt while reading this book, and most importantly to find the right words to do it justice. I already read all the books by Mr David M. Staniforth and i loved all of them. I was eagerly waiting for this new book and i was sure i'd love it. And i did!!!!!! It was amazing. The cover already captivated me and the note to the reader was even better and i was ready to dive into this story. So, Imagine you I was hesitating how to start my review, i wanted to find the right words to express how i really felt while reading this book, and most importantly to find the right words to do it justice. So, Imagine you wake up in a car parked by the side road, feeling cold and afraid. You don't remember how you got there, and worse you don't remember who you are. Imagine then that you find a journal that apparently you wrote for yourself to help you find answers. In this journal you find that you have been disappearing at the same time of each year and you don't even remember that when you get back. Is this already confusing?? There is more :) Imagine that you find out in this journal that you don't remember the first 20 years of your life. Now, how does this sound?? Outstanding!!! And then starts this journey into the mysteries of memory and dreams, the journey of a man trying to find his past, afraid of what he might find and what he might not. Tom, was an amazing character. I really liked him, connected with him and i was all along hoping that he will be the good guy not something else. The scenes were really intense, and i followed the author'e advice and listened to some of the music mentioned at the same time. I was already picturing the scenes, feeling the emotions and i had the right soundtrack to go with it. I practically felt i was right there with them!!! and this was a wonderful feeling. I like the story when it is told from the character point of view, it seems more personnel, as if he is telling it only to me. But i like it better when we have different point of views. I liked Penny, i sympathized with her. I even liked her friend Kaitlyn, she was always voicing the worst scenarios i can think of, but in a way she was kind of the voice of reason. What else can i say about this great book?? It made me think a lot about our memories, our dreams, what they really tell us, how we really know if they are true. and it is so touching in a way. As the mystery slowly unwinds, you find yourself totally caught up in the experience. Which is why I'm being very vague with the storyline. It was different to what I expected but I thoroughly enjoyed it. Staniforth is hitting his stride with this latest story and maturing as a writer. I was sucked into the enigma of how a man forgets the first 20 years of his life, and even more intriguingly, blacks out for a week they same time every year. The resolution to the mystery was not as satisfying as the quest, but I really liked this one. I’ve been inventing stories as far back as I can remember (mostly to keep me out of trouble), but began writing seriously after finishing an English studies BA as a mature student. My writing is influenced by so many things: a love of reading all genres; films; music; raising my two daughters; hill walking; and much, much more. I tend to take all I know, throw it into a setting and see what comes I’ve been inventing stories as far back as I can remember (mostly to keep me out of trouble), but began writing seriously after finishing an English studies BA as a mature student. My writing is influenced by so many things: a love of reading all genres; films; music; raising my two daughters; hill walking; and much, much more. I tend to take all I know, throw it into a setting and see what comes out.